Pasta is sometimes cooked in the way of risotto in Italian cooking, which means that it is cooked (or finished to be cooked) in stock. The pasta will take on the flavor of the stock, so this will give your pasta dish great depth of flavor. 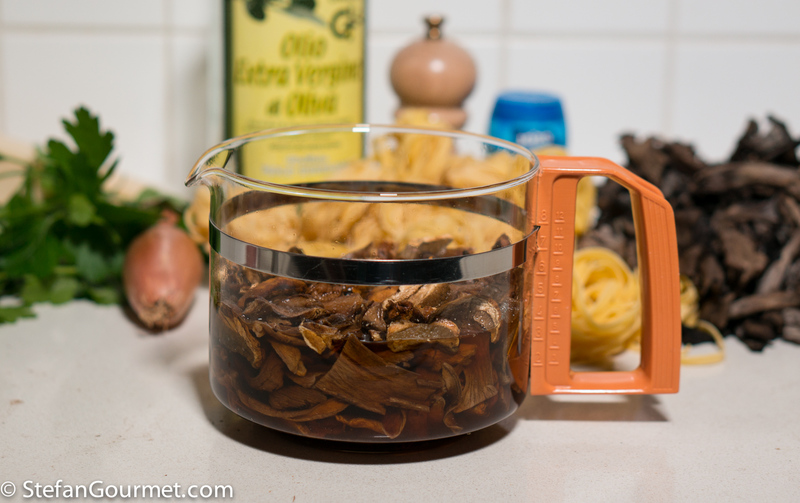 This works exceptionally well for pasta with dried porcini mushrooms, as you can use the porcini soaking liquid to finish cooking the pasta. Combined with the reconstituted porcini mushrooms, fresh mushrooms, and parmigiano, this makes for one hell of a flavor bomb from all that umami. 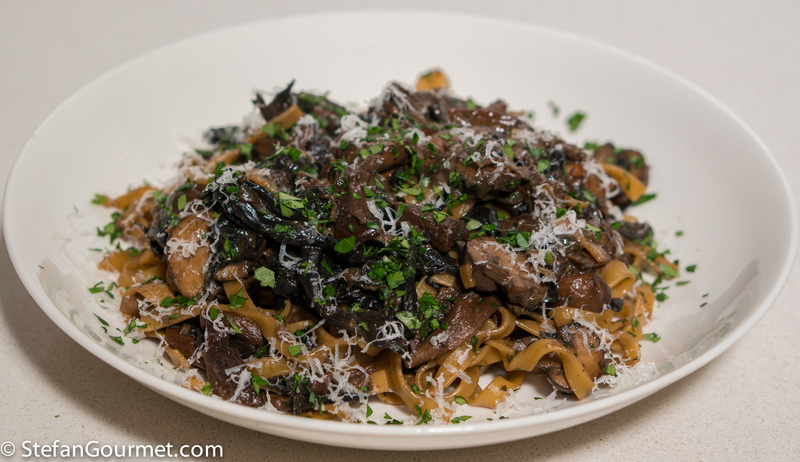 In this case I used fresh cultivated button mushrooms (also known as cremini mushrooms) and horn of plenty mushrooms, which are wild mushrooms that look like a black version of chanterelles, but you could use any mixture of mushrooms to make this. 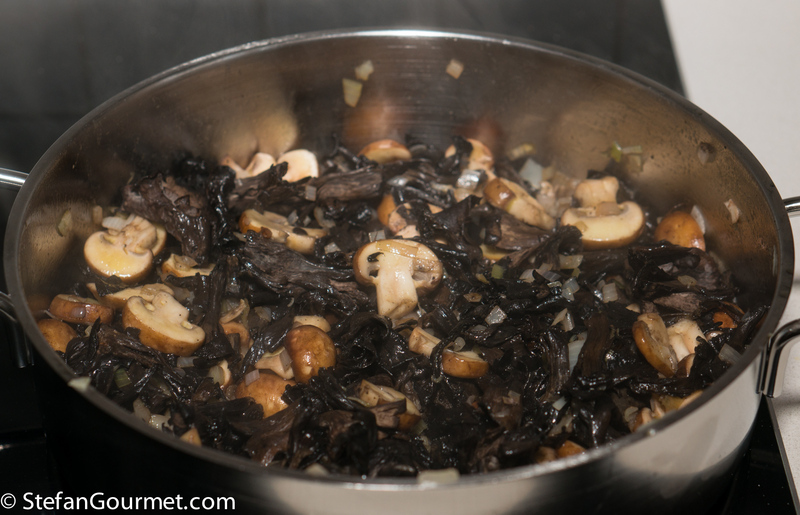 The important part is that at least one type of mushroom should be dried, as you will need the soaking water to prepare the pasta risotto style. 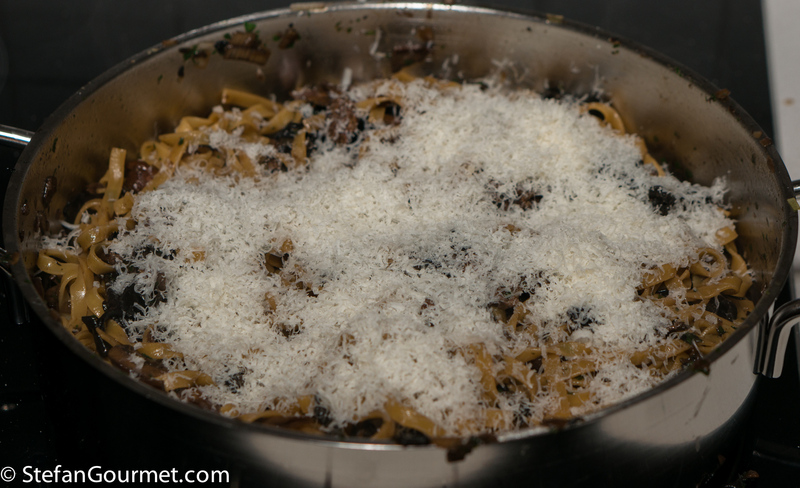 For this recipe dried pasta is the best, because it will absorb the mushroom flavor much better than fresh pasta would. 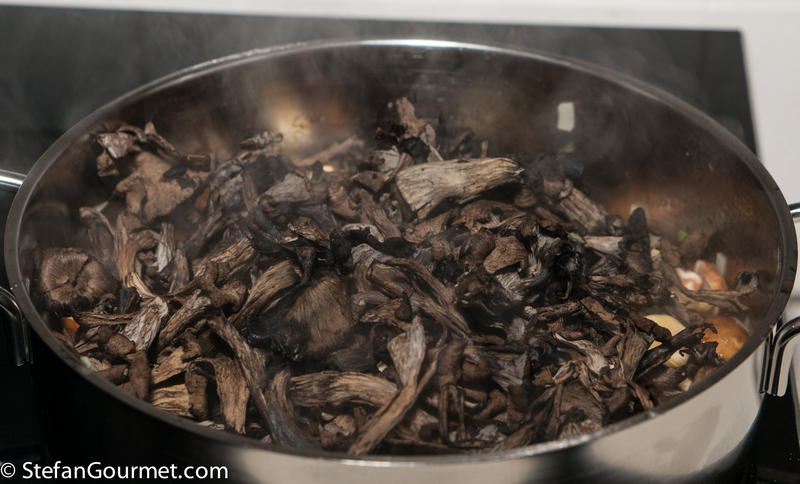 Put the dried porcini mushrooms in a bowl and add 500 ml of boiling water. Allow to soak for 10 to 15 minutes. Meanwhile, clean the mushrooms if needed and chop them roughly. Heat 4 tablespoons of olive oil in a wide pan. 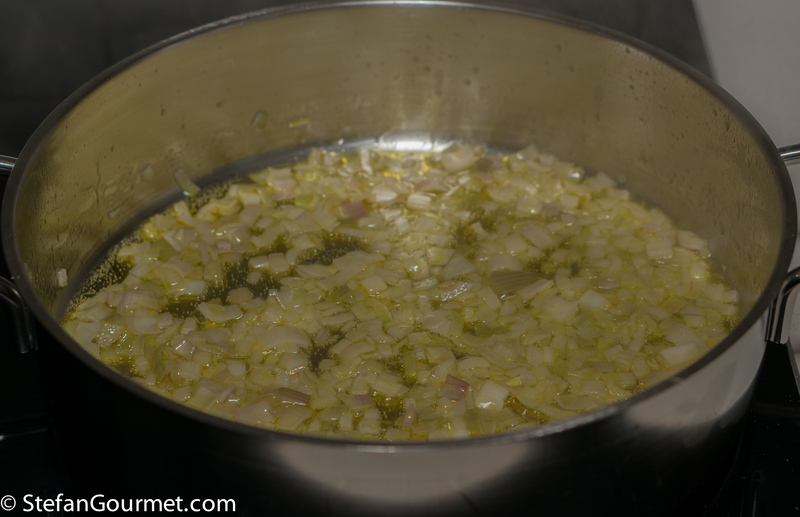 Add the minced shallot, season with salt, and stir over medium heat until the shallot is translucent, about 2 minutes. …and the horn of plenty. 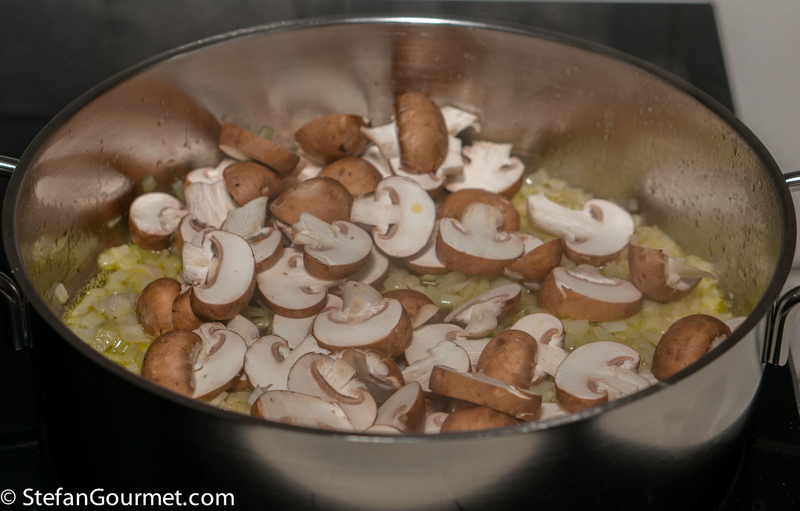 Cook the mushrooms over medium heat, stirring regularly. 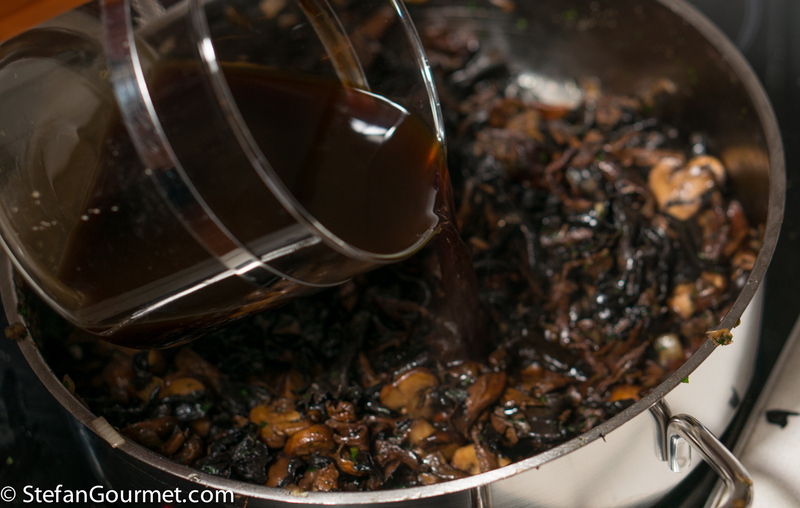 When the mushrooms are almost cooked, drain the porcini mushrooms (reserving the soaking water) and add them to the other mushrooms. Strain the porcini soaking liquid through kitchen paper or muslin. 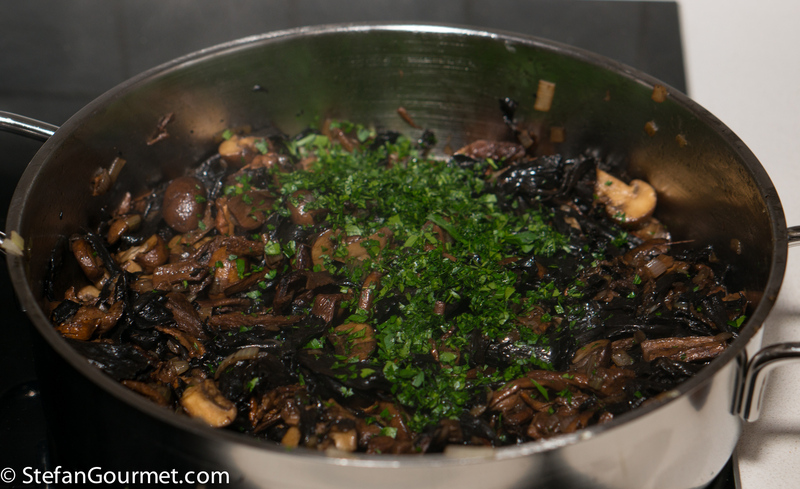 Add 2 tablespoons of minced parsley to the mushrooms and stir for another minute. Bring a large pot of water to a boil. Add salt and the tagliatelle, and set the timer for 2 minutes less than the time indicated for al dente on the package. A minute before the timer is about to beep, add the filtered porcini soaking water to the mushrooms, and bring to a boil. When the timer beeps, drain the pasta and add to the mushrooms. 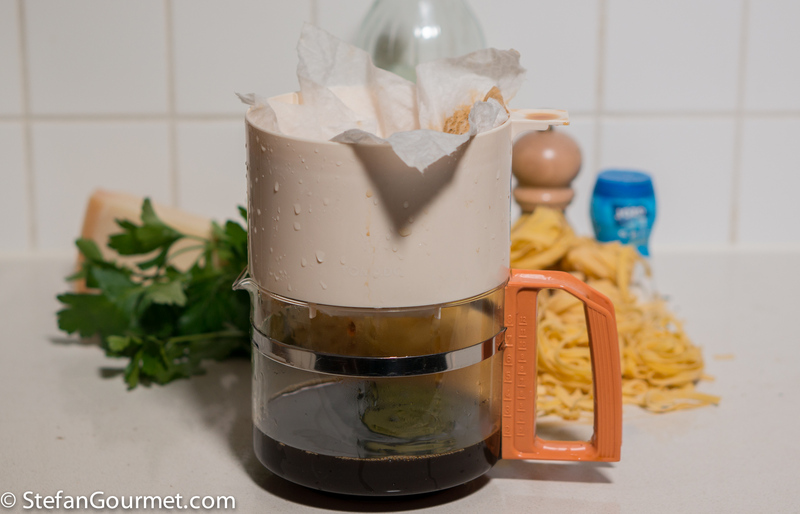 Stir over high heat so that the pasta can soak up the porcini liquid and finish cooking. Keep stirring until the liquid has almost all been absorbed, then turn off the heat. Add a generous amount of freshly grated parmigiano reggiano. Stir to incorporate, then taste and adjust the seasoning with salt and freshly ground black pepper. Serve at once on preheated plates, sprinkled with the remaining parsley and some more freshly grated parmigiano. 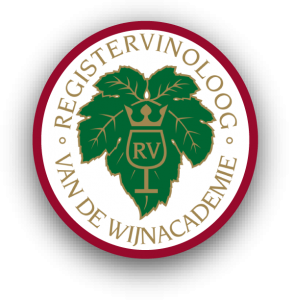 This is great with either a slightly oaked but dry white (such as Verdicchio Riserva) or a light earthy red (such as pinot noir from Burgundy). The combination of shrimp and pesto may sound strange, but you can find pasta with this pairing of ingredients on the menu of many restaurants in Italy or on Italian blogs and it works. Zucchini is a nice addition to turn this into a yummy piatto unico. 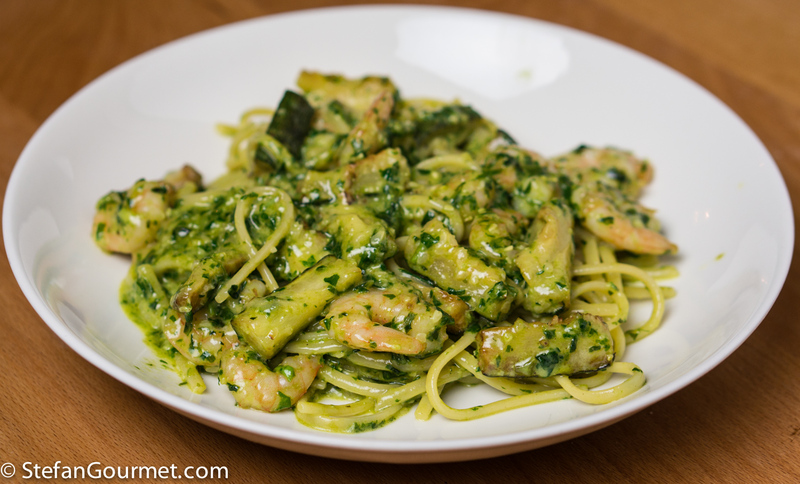 Click here to read how to prepare linguine with shrimp, zucchini, and pesto. great looking mushrooms & dish. on pasta risottata: my apologies if I sound a bore: but “pasta risottata” generally, to my knowledge, refers only to pasta cooked as if it were rice: i.e. adding some hot liquid gradually. + and I add this just to open up the conversation: as far as I know, reconstitute dry porcini do need a rather long cooking to fully unlock their full flavor: in all recipes that come to my mind, they are cooked longer than two minutes. 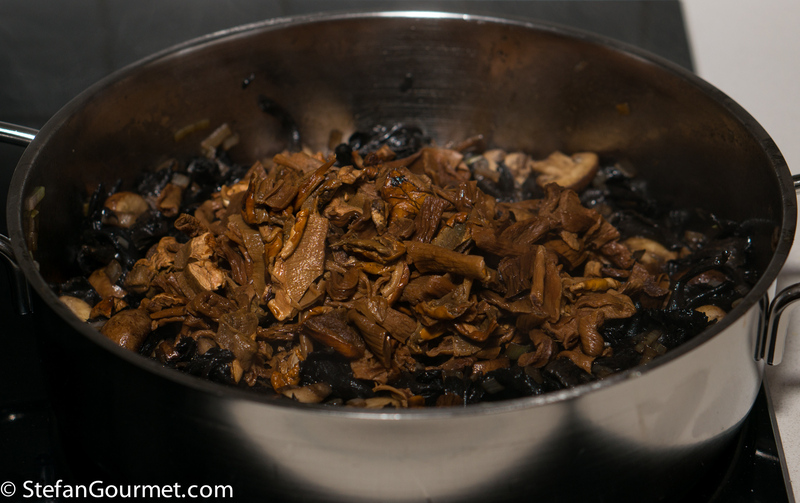 Hazan (and of course one could argue with that) mixes fresh and dry reconstituted ceps from the very beginning and then cook them for a good 30 minutes or more; I seem to recall. 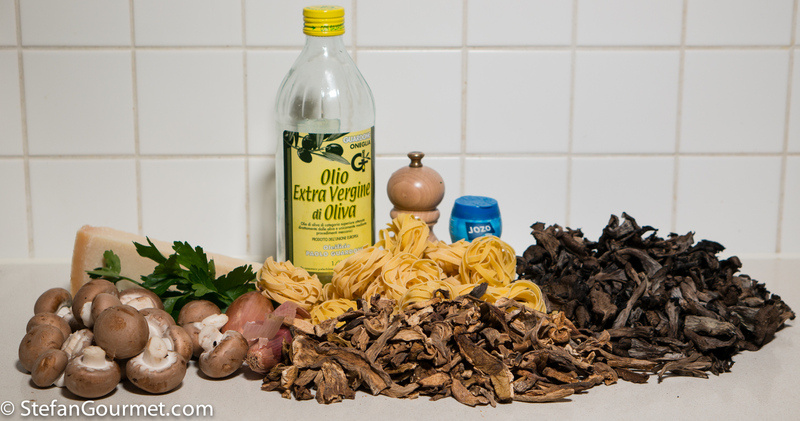 Hi Stefano, the main point here is not to add the pasta cooking water, but only use the mushroom cooking liquid. Risotto is about two things: absorbing the stock and thickening the ‘sauce’ with starch. You are correct that in my recipe it is only the first part and not the second. Like you said — I wouldn’t want it so starchy. I do not know of a better word for this and I have seen Italians call this risottata for recipes using long pasta. It is definitely not the same as saltare, because that would be with pasta cooking water. 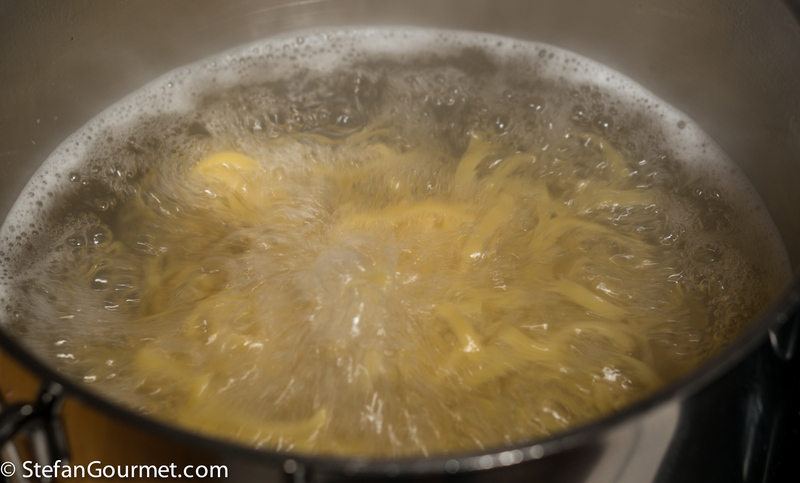 Starting with dry pasta and adding the liquid slowly is only suitable for short pasta. 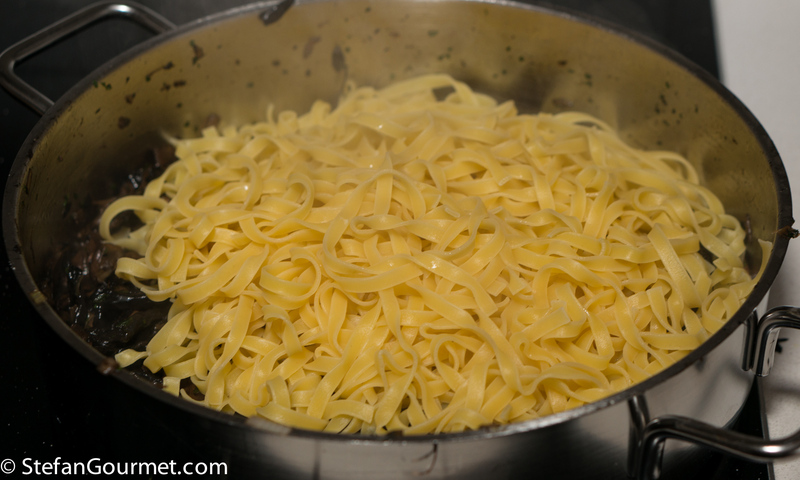 Long pasta needs to be cooked until it is pliable before it can be cooked with just a little stock. 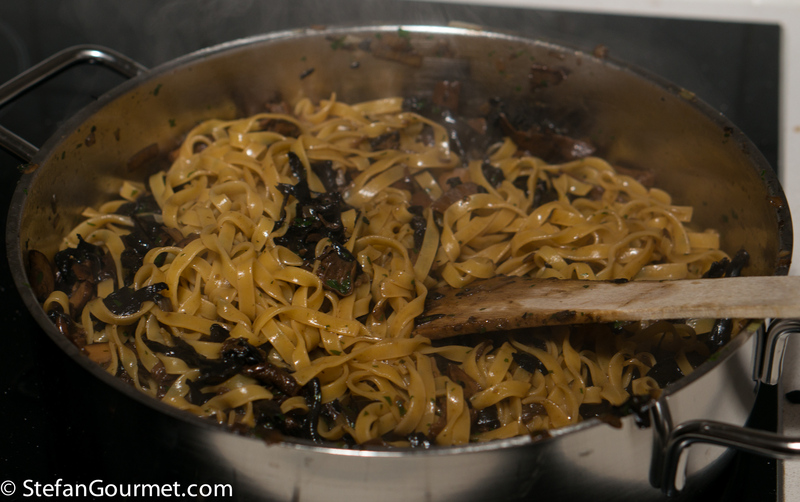 The tagliatelle I use only requires 6 minutes to be cooked al dente, and I found that 2 minutes is just enough to absorb the 500 ml of mushroom liquid, but I suppose you could parcook it for only 2 minutes and then cook it in the stock for 4 minutes by lowering the heat if you want more starch in there. In my experience, dried porcini LOSE their flavor if cooked for too long. I do not understand how long cooking can ‘unlock’ the flavor. This is an interesting thought though, so I will do some digging. Thanks for your comments, as always. P.S. I have looked at a lot of (Italian) recipes that use porcini secchi. About half the recipes tell you to cook the porcini for 5 minutes or less. Most risotto recipes will tell you to cook the porcini along with the risotto, so that is 15 to 18 minutes. I have not found a single recipe that said 30 minutes or more. Wow … interesting food for thought (pun sort of intended). I like the technique! Ignorant me: had no idea white buttons and cremini were one and the same: some recipes surely will be easier to follow! Love the method . . . have not tried thus exactly . . . love the rather heavy amount and mix of mushrooms . . . oh, verdicchio being one of my favourite wines: that too will be enjoyed !!! I think the name cremini is only used for the ones that are like white buttons (champignons), but with brown caps. They are called chestnut champignons around here. Thanks, Hans – just as well I checked ere beginning a three-hour stretch of work 🙂 ! A lot of ‘interesting’ there . . . always thought that when white buttons ‘grew’ they just became the big field ones one would stuff and bake! And also thought Portobellos, which I use a lot, were overgrown Swiss Browns . . . well, it seems I have a lot to learn: good! Actually subscribed to your link as I am in the middle of exams etc: shall read over Yule . . . thanks again !!! Ciao Stefan!I am constantly learing from you!!! I’ve lived in Italy for 30 years and never heard of “pasta risottata”… But I am glad now I know this recipe, considering my passion for porcini! Wow a mushroom bomb of flavor for sure! Looks delicious! Speaking of zucchini, this would also be good on some sautéed “zoodles”! The mushrooms sound/look amazing! Delicious dinner idea, thanks for the tips how to pair it with wine, made me hungry just reading this post!